Reference multiple controls per attribute. Access multiple forms per entity. Context – Provides methods to retrieve information specific to an organization, a user, or parameters that were passed to a form as a query string. Data – Provides access to the entity data and methods to manage data in the form. UI – Contains methods to retrieve information about the user interface, in addition to collections for several sub components of the form. 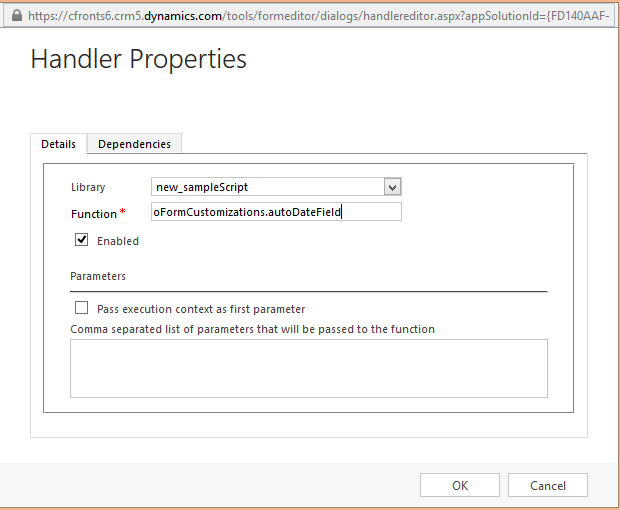 When you register a function for an event handler, CRM lets you pass the execution context object as the first parameter to the function. This object contains methods that allow you to managed variables you wish to share with other event handlers. Page.data.entity.attributes collection provides access to each entity attribute that is available on the form. Only those attributes that correspond to fields added on the form are available. controls provides access to each control on the form. controls provide access to each control that have more than one control for an attribute available on the form. controls provides a collection of controls found in a section. Page.ui.navigation.items collection provides access to navigation items that are defined using the navigation area of the form editor. 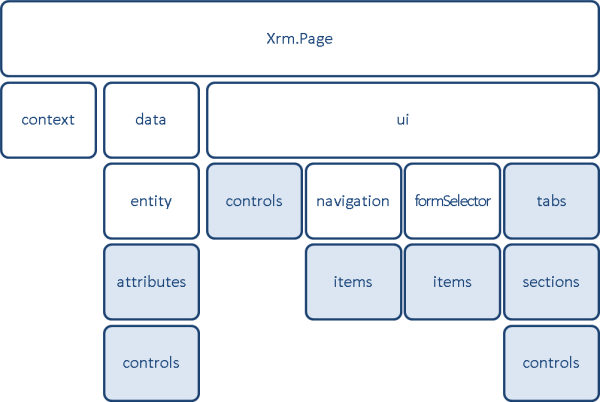 If multiple forms are associated with an entity, each form can be associated with a security role and if security roles of a user enable users to see more than one form, they can select from a collection of Xrm.Page.ui.formSelector.items. A form definition is available in this case. Page.ui.tabs provides access to collection of each of the tabs present on the form. A tab can be organized by using more than one section. The tab sections collection provides access to these sections. Hope this overview was helpful to you! OnLoad event occurs after the form has loaded. onLoad event is used to prepare the data in the form for use. When a user clicks on the save button at the bottom right corner of the screen. Code executes the Page.data.entity.save method, even when there is no changed data to be saved. The user navigates away from the page and there is unsaved data to be saved. When auto-save is enabled, 30 seconds after the data has been changed and there is unsaved data on the form. Code executes the Page.data.save and even if there is unsaved data on the form. Code executes the Page.data.refresh method passing true as the first parameter and there is unsaved data on the form. The data in the field must change. The field must lose focus. There is an exception to the Two-Option (Boolean) fields. OnChange event occurs immediately when the value is changed without requiring to lose focus. 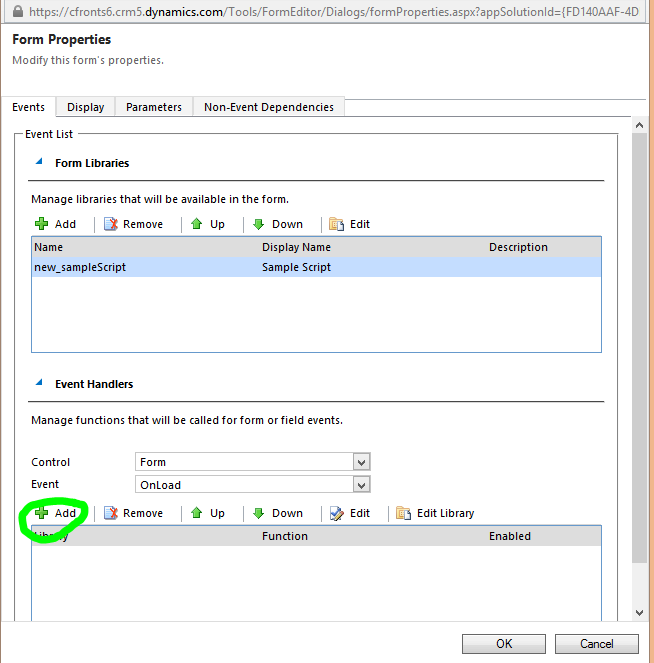 The OnChange event does not occur if the field is changed programmatically using the setValue method. Instead fireOnChange method can be used in code to trigger OnChange event. This event occurs when a tab is expanded or collapsed. This event is important in the case that you want to use script to modify the src property of an IFRAME control. This event is fired when contents of an IFRAME have completed loading. Navigate to Settings > Customizations > Customize the System. 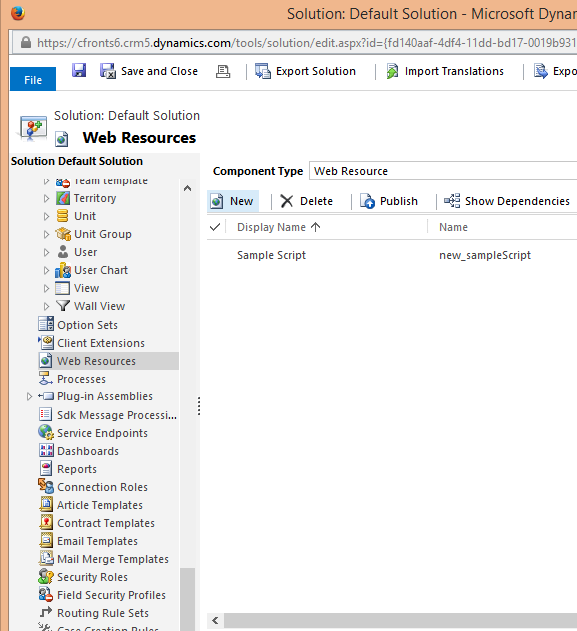 Then navigate to Web Resources under Components on the left navigation pane of the Default Solution (Default solution here is used as an example). 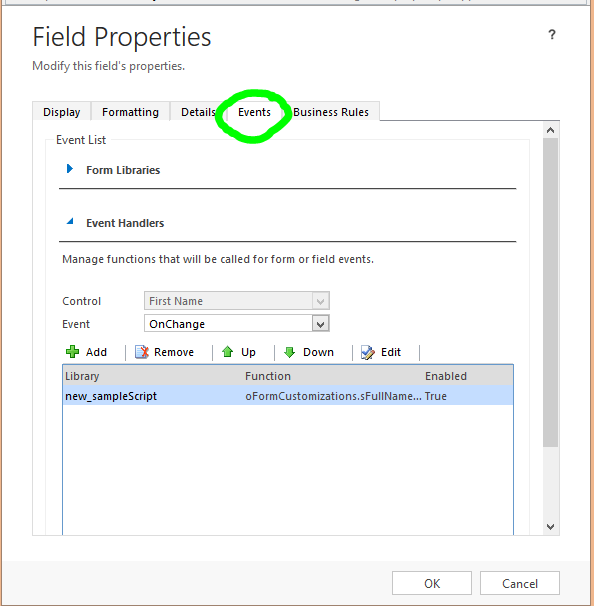 For registering events on OnLoad events, select Form Properties on the form. In Form Properties, Select the form libraries that we want to enable on the form level as shown below. 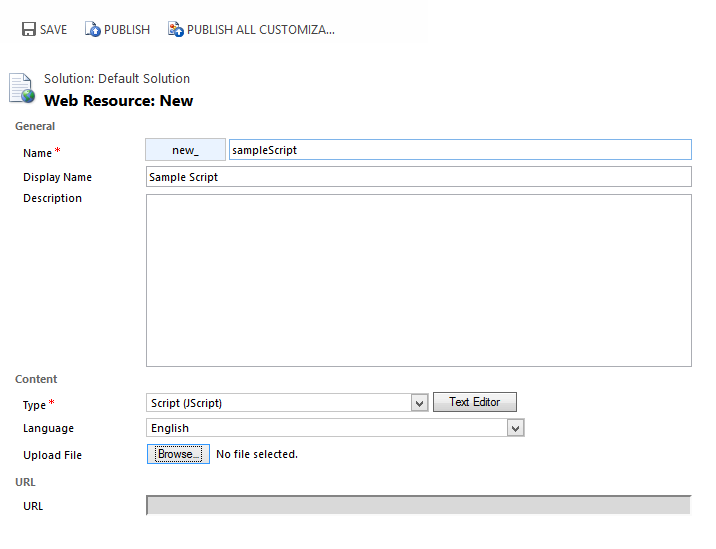 In the above example, a library called ‘new_sampleScript’ has been included. We can now add Event Listeners (which are the functions in that library) that we want to trigger when the library is loaded. Enter the name of the function you want to trigger on this event. 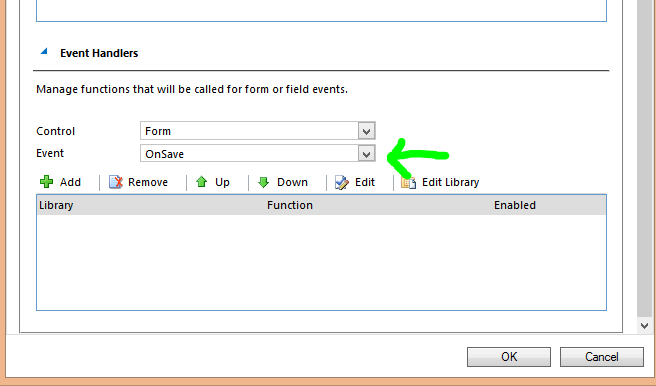 OnSave event listeners could be bound by simply changing the Event to OnSave as shown below. Navigate to the desired field and select its properties. Follow the steps as illustrated for OnSave and OnLoad events above.